Is this one class or two? The Between Two Homes®:Children in the Middle class is one class, divided into two parts: Part 1-The Adults, and Part 2-The Children. Both classes are for adults only. You purchase both tickets separately for each part. The cost of the ticket for each part is $40.00. 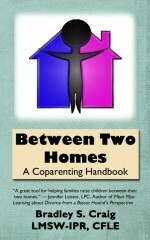 What is the difference between the Between Two Homes® coparenting class and the Children in the Middle coparenting class? The Between Two Homes®: Children in the Middle Coparenting Class is our live class offered to families within the Dallas-Fort Worth metropolitan area including the counties of Collin, Dallas, Delta, Denton, Ellis, Hunt, Johnson, Kaufman, Parker, Rockwall, Tarrant, and Wise. The Between Two Homes® Coparenting Class is our live class offered to families outside of the Dallas-Fort Worth metropolitan area including the counties of Collin, Dallas, Delta, Denton, Ellis, Hunt, Johnson, Kaufman, Parker, Rockwall, Tarrant, and Wise. Is the online Making Two Homes Work class™ that same as the live Between Two Homes®:Children in the Middle class, and will the courts accept a certificate for the online class in lieu of the live class? While the online class is based on the material in the live Between Two Homes®:Children in the Middle class, there is information and video content that differs because of delivery options. The online class is approved in many jurisdictions to meet the criteria of a mandated coparenting(divorce) education course, but please click here for more information if you are concerned whether the class will be accepted by your judge in lieu of a live class. Bottom line, make sure the judge in your case will accept the online version of the class before taking the class. Can I attend the class if I am not court ordered? Absolutely, we have seen a large increase in parents and relatives taking the course voluntarily or through the recommendation of another professional. Do I need to take the classes in order? The class may be taken in either order, though we encourage you to attend Part I first. Do I need to purchase tickets for the class in advance? Yes. We stop selling tickets at 5:00 pm CST two days before the day of the class or when tickets are sold out, whichever occurs first. (Ex: For a class being offered on a Saturday, you must purchase your ticket before 5:00 pm CST on Thursday.) We do not allow walk ins and we do not sell tickets at the door. What type of payment do you accept for a ticket to the class? If you do not have a credit card, you may use a debit card. We do not accept cash or checks. Do you allow late admission to the class? No. We encourage you to think of your ticket as an airline ticket, the plane takes off at the start of class. We have a strict policy that prohibits late entrants to our classes. Doors are locked at the time specified as the start of class. You will be turned away at 6:01 p.m. for a 6:00 p.m. class. Sign in for the class begins 15 minutes before class starts, so we encourage you to plan to arrive early. If you are 2 minutes late for the class, you are actually 17 minutes late for the check in process. Your payment for your ticket reserves your seat on the date you selected. If you do not arrive on the date you specify or you arrive late for the class, your money is not refunded or credited. Why don't you let participants in late to class? It is disruptive to the class and other participants when you arrive late for the class. We provide a certificate to the court indicating exactly how long you participated through the duration of the course and the minimum for this class is 3.5 hrs. per part. What do I do if I arrive late to the class and the door is already locked? If you arrive late and the door is already locked, you will not be allowed in. Please DO NOT disturb the class already in progress. If you choose to knock/bang on the door and disrupt the class, the police or security will be called, and the court may be noticed. The instructor needs to focus on teaching the class and cannot unlock the door to have a conversation with you. Disruptive behavior will not be tolerated. If I arrive late, can I get a refund for my ticket or will you apply my payment to another ticket for another class? If you do not arrive on the date you specify or you arrive late for the class, your money is not refunded or credited. Think of it as an airline ticket, if the plane leaves and you don't cancel in advance you won't get your seat refunded. What is your REFUND policy? If you do not cancel your ticket BEFORE the deadline, if you do not arrive on the date you specify or if you arrive late for the class, your money for that specific ticket will NOT be refunded or credited. Think of it as an airline ticket, if the plane leaves and you don't cancel in advance you won't get your seat refunded. Doors are locked at the start of class so we encourage you to arrive 15 minutes prior to the start of class. DEADLINE: The deadline to cancel is at 5:00 pm CST two days before the day of the class. Ex. to cancel a Thursday class, you must make your cancellation payment before 5:00pm CST on Tuesday. What is the DEADLINE to cancel a ticket? The deadline to cancel is at 5:00 pm CST two days before the day of the class. Ex. to cancel a Thursday class, you must make your cancellation payment before 5:00pm CST on Tuesday. What is your CANCELLATION policy? In order to cancel a ticket for the class, you must pay a $5.00 cancellation fee before 5:00 pm CST two days before the day your class is scheduled for. (Ex: To cancel a Saturday class, you must make your cancellation payment before 5:00pm CST on Thursday.) Use the payment button from the next question below to cancel. Please add the participant's name and the date and location of the ticket you want to cancel on the bottom space. The $5.00 cancellation fee per request per person must be paid prior to confirmation of the requested change. To pay this fee and request your cancellation please fill in the information below and click on add to cart. Please make sure to use the same e-mail address you used when you purchased your original ticket. To earn a certificate, all participants must stay the full duration of the class. If you leave early, you would need to repeat the entire class to receive a certificate. In cases such as special needs, please notify us via e-mail right away, but no later than 5:00 pm CST two days before the day your class is scheduled so we can explore the best solution for you. In cases involving protective/restraining orders or other orders prohibiting parents from attending the same class, please send us a copy the order and notify us via e-mail right away, but no later than 5:00 pm CST two days before the day your class is scheduled so we can explore the best solution for you. Do you allow cell phones, electronic devices, computer watches, pagers, or text messaging devices to be turned on during the class? No. It is very disruptive to the class when cell phones and other electronic devices go off during the class. If you are texting during the class or surfing the internet, you are not participating in the class and will be told to leave the class. Do you provide lunch/dinner for participants if the class falls within the lunch/dinner hours? No, we do not provide meals during our classes. The classes are only 3.5 hours long and we are trying to keep class costs to a minimum to keep them affordable. Can I bring my own snacks/lunch to the class? Yes, you can bring your own snacks and nonalcoholic beverages. Can I smoke or vape during the class? No. Do we get a break during the class? Yes, there is one 10 minute break half way through the class. Can I bring someone with me to attend the class? Yes, but they would have to pay for their own ticket to reserve a seat. There is no waiting area for anyone not participating in the class. Can I bring my child or is childcare provided? Neither session is appropriate for children. No childcare is provided. Please do not bring children of any age to the class. If you bring a child of any age to the class, you will not be allowed into the class. Do both parents have to take this class at the same time? We do not require parents to take the class at the same time, though some parents find it helpful to do so to start applying the information at the same time. However, a court may order parents to take the class together. In cases involving protective/restraining orders, please send us a copy the order and notify us via e-mail right away, but no later than 5:00 pm CST two days before the day your class is scheduled so we can explore the best solution for you. What if there is a protective order, restraining order, or other legal document that prohibits both parents to attend the class together? In cases involving protective/restraining orders, please send us a copy the order and notify us via e-mail right away, but no later than 5:00 pm CST two days before the day your class is scheduled so we can explore the best solution for you. Is the class offered in foreign languages? Currently, we don't have enough participants per month to sustain the class in other languages. Please notify us and provide us with the name of the interpreter, before 5:00pm CST two days before the day of your class, and we will allow you to bring an interpreter at no additional cost if you do not speak English or Spanish. To take our Spanish class, please click here. Do you stop selling tickets for the classes? At the end of each part of the class before you leave, you will receive a certificate made out to the name you typed in when you paid for the class. In all you will receive two certificates, one for Part 1 and one for Part 2. Please make sure to pick up your certificate at the end of class. What if I forget my certificate? Forgotten certificates are held for one month from the date of class. If you forget your certificate at the class, please e-mail us. The certificate can be mailed to you if you send a self addressed stamped envelope. If you are requesting a forgotten certificate after one month since the date of class but within the past 24 months or you want your certificate faxed or scanned to you, please follow the instructions below for a replacement certificate. Requests for replacement certificates must be made via e-mail from the original account you paid for the class. To protect your confidentiality, we will not communicate with anyone but you about your participation in the class, and your specific e-mail address helps ensure this. You must have completed the course in the past 24 months. To receive a certificate, you must provide us with the date you took the class, the location you took your class, and your full name. There is a $5.00 administrative fee charged per certificate for replacement certificates. Once payment has been processed, you will receive an e-mail with your replacement certificate within 24 to 48 business hours. If you would like the certificate mailed to you, you may send a self addressed stamped envelope to our mailing address. To pay for a certificate, fill in your information below and click on add to cart. Click here to return to the class description page. Don't see the answer to your question? Please send an e-mail with your question to: support@childreninthemiddle.com or call (800) 239-3971.